The Penner Research Group website. ACS Applied Materials and Interfaces 11 (2019) 4757. Biomolecular damage caused by elevated serum glucose manifests in the glycation of molecules found in blood. The concentration of glycated molecules provides a direct indication of this damage, and the degree to which normal blood glucose has been elevated, over a specified time period. 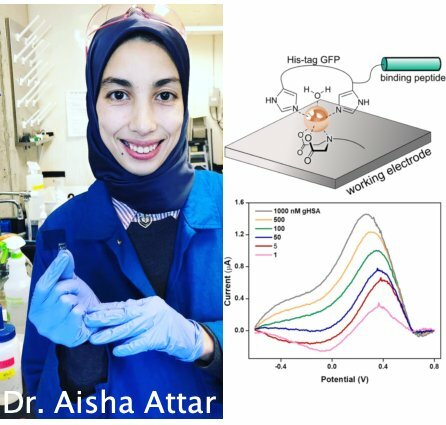 Aisha and her coworkers devised an elegant electrochemical biosensor able to rapidly and simultaneously measure the concentration of both forms of HSA - glycated and non-glycated. The detection limits she demonstrates exceeds the requirements for intermediate-term glycemic control monitoring in diabetes patients at 5 and 1 nM for albumin and its glycated forms, respectively. Niko (left) and Alana with Reg on her graduation day (er, Alana's, that is), Nov. 30, 2018. Chemistry of Materials 30 (2018) 6549. 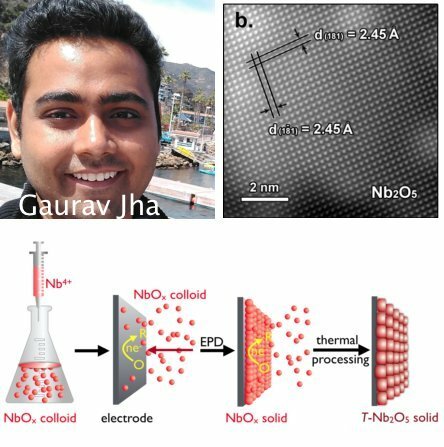 Gaurav has developed an electrophoretic deposition (ED) process for the synthesis of T-Nb2O5 thin-films. Crystalline, phase pure films of orthorhombic, T-Nb2O5, are obtained by post-deposition calcination. These films exhibit unusually high specific capacities for Li+-based energy storage as a consequence of 70% porosity. For example, a 60 nm thick film displays a Csp of 420 mAh/g at 5 A/g and 220 mAh/g at 50 A/g; higher than the theoretical Faradaic capacity of 202 mAh/g. T-Nb2O5 films also have a specific energy density in the range from 770 - 486 Wh/kg, and a specific power density in the range from 9-90 kW/kg. Good-bye to Su-Ho, and Hello to Yong-Jin on June 29. With (from left) Professor Il-Doo Kim (KAIST), Reg, Su-Ho Cho, and Yong-Jin Jeong, (both of KAIST). The fist symbolizes something at KAIST. ACS Sensors 3 (2018) 2152. 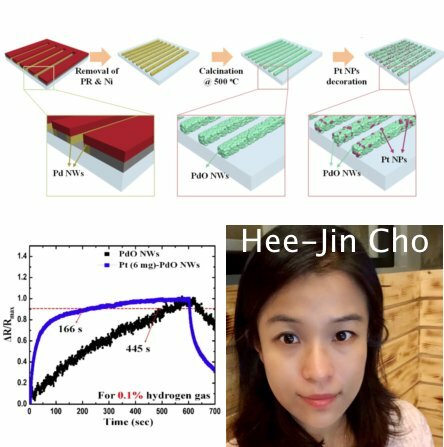 Hee-Jin prepared arrays of palladium oxide nanowires using LPNE followed by calcination. Platinum nanoparticles were then functionalized on PdO NWs enhancing the detection capability of the Pt-loaded PdO NWs sensors toward H2 at room temperature. Pt NPs activated the dissociation of H2 and oxygen molecules through the spill-over effect, and the subsequent diffusion to the PdO surface, which transformed the entire surface of the PdO NWs into reaction sites for with H2. As a result, the Pt-loaded PdO NWs showed an enhanced sensitivity of 62% compared to that (6.1%) of pristine PdO NWs. The Pt-PdO NWs exhibited a response time of 166 s, which was 2.68-fold faster than that of pristine PdO NWs (445 s). ACS Applied Materials and Interfaces 10 (2018) 35344. Shaopeng developed a new wet-chemical and electrochemical process - the EESC - for fabricating radial junction LEDs. 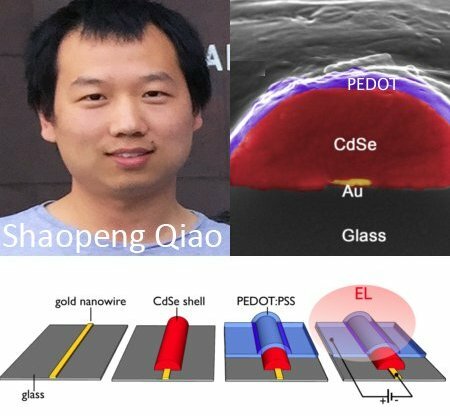 Hole injection, at a high barrier CdSe-PEDOT:PSS interface, is facilitated by a contact area that is much larger than the complimentary gold-CdSe electron-injecting contact contributing to low voltage thresholds (1.4 - 1.7 V) for EL emission. Au@CdSe@PEDOT:PSS wire EL emitters are 25 microns in length, amongst the longest so far demonstrated to our knowledge, but the EESC process is scalable to nanowires of any length. Analytical Chemistry 90 (2018) 9338. 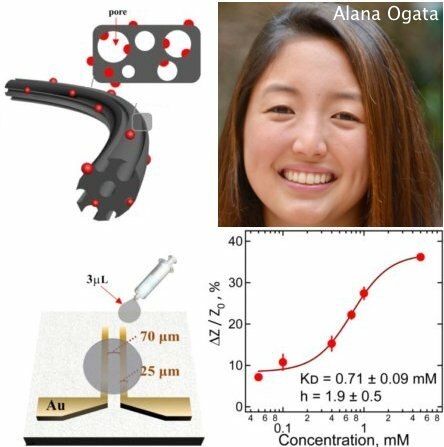 Alana has developed a new type of chemiresistor, the impedance-transduced chemiresistor (ITCR), for the rapid analysis of glucose. The ITCR exploits porous, high surface area, fluorine-doped carbon nanofibers prepared by electrospinning of fluorinated polymer nanofibers followed by pyrolysis. These nanofibers are functionalized with a boronic acid receptor and stabilized by Nafion enabling glucose detection. The recognition and binding of glucose by the ITCR is detected by measuring its electrical impedance at a single frequency.